SARD EX Power Filter - Dezod Motorsports Inc - Home of the automotive performance enthusiast since 2002. Upgrade you performance while maintaining your stock airbox with a SARD EX Power Filter. 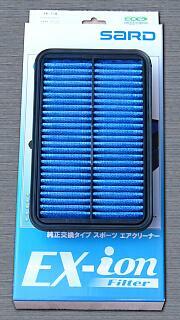 Direct replacement for OEM Filter, the SARD EX Power Filter provides increased air flow resulting in more power. Additional longevity is achieved by using cleanable, reusable filter material.